Slurping Soup and Other Confusions: true stories and activities to help third culture kids during transition. Slurping Soup is a book written for children. 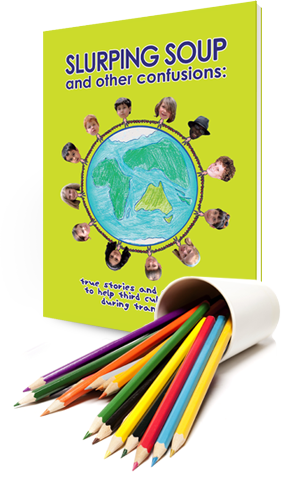 It is a collection of twenty-three real life stories from third culture kids. Each story is followed by a related activity. Slurping Soup And Other Confusions is a collection of twenty-three real life stories from third culture kids. Each story is followed by a related activity. The activities are suitable for three to twelve year olds and include brainstorming, problem solving, party planning, family tree, madlib etc. The book aims to help children cope with the challenges of living internationally. This charming book is a catalyst for crucial discussions every expat family needs to have.